Gaza denies reports of a merger with PA police forces in another declaration that Hamas will rule a unity government. 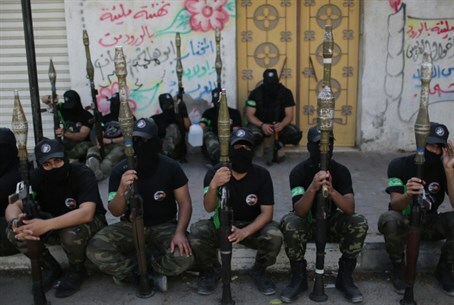 Hamas representatives clarified Saturday night that they would not dismantle their "military wing," the Al-Qassam Brigades, as part of their unity pact with Fatah. Nor would the Brigades be merged with the Palestinian Authority (PA) police forces, according to the official. "Talk over such a move is nonsense," a representative stated to Al-Monitor Saturday. "The Al-Qassam Brigades existed before the [Palestinian] Authority, and they retain the right to independent decision regarding the struggle against Israel." Hamas members fervently deny reports by London-based Al Quda Al-Arabi that the wing would be merged with Fatah's "military forces" as part of the unity pact and a reconciliation agreement between the groups. Hamas continues to be adamant over its control of a "unity" government, expressing over and over again that it would remain in control of both Gaza and the PA after elections and insisting that Ismail Haniyeh would rule the government. Mahmoud Al-Zahar, a senior official and co-founder of Hamas, took issue with claims of a united military force last week, spewing sharp criticism over the issue to Reuters. "Nobody will touch the security sections in Gaza. No one will be able to touch one person from the military group. Nobody asked for that," Zahar declared. He also claimed that PA Chairman Mahmoud Abbas is "lying" about being in charge of a unity government and charged him with vying for the continuation of US aid. Hamas and Fatah's reconciliation deal last month has raised security concerns in Israel and utterly torpedoed peace talks. However, international response to the deal has been mixed, and the European Union (EU) has dismissed those concerns based on its conviction that PA Chairman Mahmoud Abbas, not Hamas leader Ismail Haniyeh, would remain in charge of a unity government. "The EU expects any new government to uphold the principle of non-violence, to remain committed to achieving a two-state solution and to a negotiated peaceful settlement ... including Israel's legitimate right to exist," EU foreign policy chief Catherine Ashton insisted last week. "The fact that President Abbas will remain fully in charge of the negotiation process and have a mandate to negotiate in the name of all Palestinians provides further assurance that the peace negotiations can and must proceed."